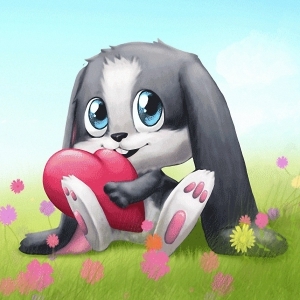 Schnuffel is an animated kind, gentle, fun-loving rabbit made at the end of 2007 for the marketing of one of the German media company Jamba! ringtones, yet the first concepts of the Schnuffel character were born in July 2. The ringtone was turned into a song by Sebastian Nussbaum and Andreas Wendorf and recorded under the title Kuschel Song ("cuddling song"). The single was released in February 2008 and the ringtone rabbit made it immediately to the top of the German and European charts. After the song went to the top of the Austrian charts and to number 2 in Switzerland, plans were made to release the song internationally. The songs were translated in 13 languages and 13 albums have been released, including German re-editions and international albums. Schnuffel was introduced into the US market on January 17, 2010. The Schnuffel ringtone commercial once aired on MTV, MTV2, Comedy Central, TeenNick, and ABC Family.